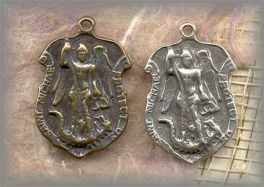 "SS.MSM.002 - ST MICHAEL SHIELD - vintage, unknown (1 in.)" |||||ST. MICHAEL SHIELD: (feast day Sept 29th) Michael means "Who is like to God?" He fights the spiritual war for us when called on against the evil one. He has been invoked as patron and protector by the Church since the first century, the time of the Apostles. Patron of grocers, mariners, paratroopers, police, grocers, sailors, and those who are sick. ABOUT OUR MEDALS: All medals on our site are hand cast in sterling and solid bronze from antiques and vintage pieces then antiqued to restore original patina.